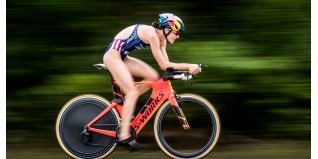 Olympians Gwen Jorgensen of USA and Richard Murray of South Africa move into first place after the second day of competition following the Enduro stage of the Island House Invitational Triathlon, a unique three–day triathlon event in the Bahamas. Day 2 of the Island House Invitational Triathlon presented a unique racing situation for both short course and long course athletes as the five leg course Enduro course mixed up the traditional order of swim, bike and run. Athletes raced a course comprised of a 750 metre swim, 5km run, 40km bike, 750 metre swim and a final 5km run. In the women’s race, the mass start kept athletes close together during the initial swim leg of the day, with a large pack exiting the water together. US gold medalist, Gwen Jorgensen, asserted herself during the first 5km run to take the lead at the start of the bike. However, non-drafting, long course specialist and leader after day one, Holly Lawrence, used her bike strength to complete the bike leg with the fastest time on the day. Lawrence started the final swim and run legs with a 50 second lead over a pack that included Flora Duffy, Helle Frederiksen, Ellie Salthouse and Jorgensen. The short course athletes worked together on the second swim leg, narrowing the gap to Lawrence to 30 seconds heading into the 5th and final leg of the day. Once again, Jorgensen proved invincible on the run, covering the final 5km in 16:52 for the fastest run split on the day and a 45 second lead on general classification (“GC”) heading into day 3. Despite dealing with cramps after the second swim, Duffy ran her way into second place on the Enduro stage, ahead of Salthouse. Lawrence faded to 4th on the stage, but she did enough to remain 2nd on GC, 10 seconds ahead of Duffy. Day 2 also saw lead changes in the men’s race with the overnight leader on GC, Aaron Royle from Australia leading the initial men’s swim pack. However, South Africa’s Richard Murray gapped the pack during the first run leg, posting a time of 15:21 for 5km, and he maintained that lead throughout most of the bike. Cameron Dye of the USA was the biggest mover on the bike, taking the lead over Murray during the closing miles and the two started the final swim and run legs in close proximity. Once again, Murray proved the strong on the run and he edged ahead of Dye to cross the line in first place and earn first place on GC after two days of competition. Dye’s performance was enough to catapult him into second place overall after the two stages, while New Zealand’s Terenzo Bozzone’s consistency during the Enduro stage kept him in 3rd place on GC. The action continues on Sunday with the final day’s sprint distance stage, a mass start event which comprises a 750m swim, a 20km bike and a 5km run on the private island of Highbourne Cay. The athletes are competing for share in a $500,000 prize purse. For race coverage, please follow @islandhousetri on twitter for updates and links to additional coverage and timing. For more details on the event, check out the Island House Invitational Triathlon website.